Life is full of mysteries, you never know what is coming next. To surprise Zapals valuable customers, we mixed a quantity of Grab Bags for your support. 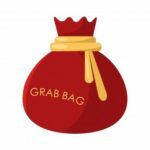 Check the Grab Bag now and see what will surprise you. The Zapals Grab Bag is a mystery, and particularly wrapped gift package with lucky involved, you never know what might inside the Grab Bag.